Mary II (30 April 1662 – 28 December 1694) was joint Sovereign of England, Scotland, and Ireland with her husband and first cousin, William III and II, from 1689 until her death. William and Mary, both Protestants, became king and queen regnant, respectively, following the Glorious Revolution, which resulted in the deposition of her Roman Catholic father, James II and VII. 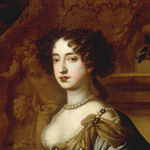 William became sole ruler upon her death in 1694. Popular histories usually refer to their joint reign as that of "William and Mary".